The first printed source (Florence 1560) for the gagliarda contains 166 step combinations. Review in: Dance Chronicle 22 (2/1997), pp.209–212; Dance Research XIV, 1/1996, pp.89-91. 233 pp., ISBN 3 931344 01 0; currently out of print/new edition in preparation. A clearly arranged compilation of the steps of all Italian sources (Compasso, Foligno MS, Lupi, Lutij, Caroso, Negri). Synoptic presentation of Caroso's and Negri's descriptions. Review in: Dance Chronicle 22 (3/1999), pp. 419-428; Concerto 140 (1999), p.18. The Instruction was probably written around 1610. In addition to branles, to be found in it are pavaniglia variations and numerous dances for which Praetorius provided the music in his dance collection Terpsichore. The new edition contains the complete French facsimile with transcription, an overview of all the steps, comparisons with other sources, and a survey of German history around 1600.
Review by Regine Astier in: Dance Chronicle 24 (2/2001), pp.223 – 226; Concerto 168 (2001), p.16. Newly edited and introduced by Uwe Schlottermüller. Abstracts in English and French. Steps translated by Barbara Ravelhofer and Véronique Daniels. The appendix to Pasch's conduct book from 1659, which is interesting from the point of view of cultural history as well as enjoyable to read, contains six dances with music and step combinations. This (until now) unknown source from the mid-seventeenth century is probably valid not only for the dance culture in Germany, but likewise for Ballet de cours and early French opera. Review in: Concerto 168 (2001), p.16. Rinaldo Corso: Dialogo del Ballo. A Conversation about Dance. Rinaldo Corsos 1555 erschienener 'Dialogo del Ballo' ist hier erstmals in deutscher Übersetzung zugänglich. In der vorliegenden Ausgabe werden nebeneinander der deutsche und der italienische Text dieses Dialogs präsentiert, in dem ein Herr seine Gesprächspartnerin von den Qualitäten des Tanzes überzeugt und ihr dessen Herkunft und Geschichte darlegt. edited by Uwe Schlottermüller and Maria Richter. The volume contains all fourteen lectures as well as an article on the gavotte of the Instruction pour dancer with a possible reconstruction. edited by Uwe Schlottermüller, Maria Richter and Howard Weiner. All (sixteen) lectures included as well as introductions in English and German to the short performances, dance evenings and workshops held on the symposion. Since the proceedings are out of print, you have now the possibility to read the essays online. 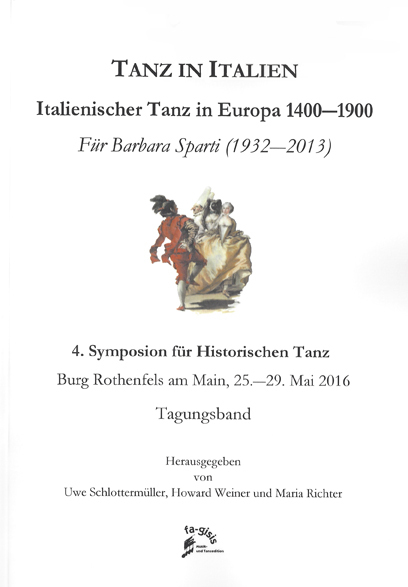 Die Vielfalt der europäischen Tanzkultur 1420 - 1820. All lectures included, as well as introductory notes in English and German to the short performances, dance evenings and workshops held on the symposion. To read the articles online, look in this Table of Contents. Texts of all Symposium lectures and posters with German and English summaries. Adam Wolfgang Winterschmid: Kurze und leichte Anweisung, die Compagnie-Tänze in die Choregraphie zu setzen …, Altdorf 1758. (= Freiburger Hefte zur Tanzgeschichte, Bd.1), Faksimile, Freiburg 2008.